Europe is Great – Just in denial ! 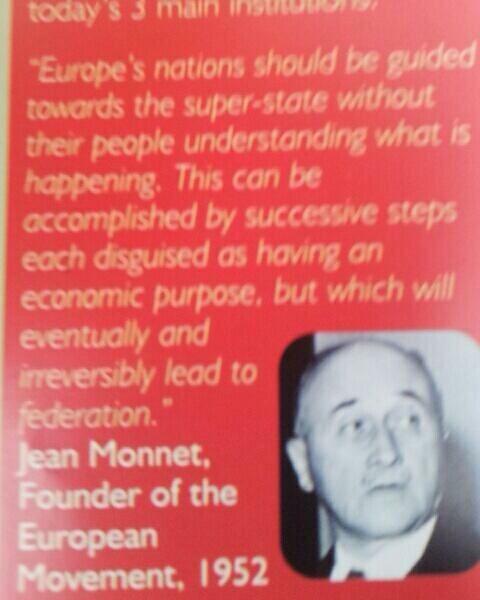 European Union: What did Monnet say about Europe’s nations and the superstate ? There is a popular belief at present that the entire European Union project is occult. Most would immediately associate occult with supernatural influences or even the Satanic outright, but occult should be read in its literal dictionary meaning: ‘hidden’, ‘concealed’. For those not familiar, Rense is a famous ‘conspiracy theory’ site run by Jeff Rense: More a clearing house than source. This is not case closed on discrediting as conspiracy theories do sometimes turn out to be conspiracy fact. Checking through the sources quoted in the article it has not been possible to track down a copy of the letter which is referred. Absent being able to determine its source it is not clear if it is genuine or not. It is true that Vaclav Klaus quotes Monnet in the book, but Klaus attributes the quote not to a letter to a friend, but in a speech Monnet delivered to the UN on the 30th April 1952. The US National Press Club is not the UN: Which appears to contradict Klaus’s sourcing. It should be noted that in Klaus’s text there does not appear to be any footnote indicating source for his quote, only the claim of the author. Monnet’s address in Washington was speaking of the Plevan plan: That was a plan proposed in October 1950 by French Premier René Plevan to create a supranational European Army as part of a European Defence community. The plan’s main architect was Jean Monnet. Monnet has stated that the people of Europe broadly supported the plan, and the key European powers at the time ratified the plan. This is recognizing the fundamental problem with European cooperation and integration towards a federal structure, following a summary of the history of how European sovereignty has evolved along nationalist lines over the past 1000 years. This is just statement of common sense in the aftermath of WWII, which is still true to this day. No where in the address does Monnet say what is attributed to him by Vaclav Klaus or Philip Jones. ‘Mais les récentes proposition soviétiques vont à l’encontre des enseignements de l’Histoire. Au moment même où les Européens de l’Ouest se rassemblent et fusionnent leurs souverainetés afin de répondre aux problèmes d’aujourd’hui, l’Union Soviétique se révèle comme le champion en Europe du maintien des souverainetés nationales qui entraînerait le maintien des divisions entre les Européens. ‘But recent Soviet proposal goes against the teachings of history. At the same time that Western Europeans come together and merge their sovereignty to meet the challenges of today, the Soviet Union reveals himself as the champion of Europe in maintaining national sovereignty resulting maintaining divisions between Europeans. This abstract leaves the reader to interpret these words from 1952 as they wish. To understand why there appears to be a conspiracy against Monnet, and this particular speech, one should understand carefully how the art of provokatsiya works, particularly when applied to for the aim of undermining political authority and subversion. The technique relies on remaining occult in order to work. This entry was posted in Federal Europe, Uncategorized. Bookmark the permalink. 1 Response to European Union: What did Monnet say about Europe’s nations and the superstate ? Agree that Montesquieu ideal was right. But it was subverted. Dezinformatsiya: A Ukraine-China-Russia Nuclear 12k-15k troop Tango.